Live on ITV Racing at 3pm on Saturday is showing the 32 Red Veterans’ Handicap Chase will take place at Sandown Park, a three mile contest testing the mettle and talents of some of the best older campaigners around. As you’d expect, this is an open and highly competitive contest in store, with several horses capable of running very well. The David Pipe trained Dynaste is arguably the most classy name on display, but the eleven year old has been a shadow of his former self in recent seasons and has a lot to prove. The upshot is he runs from a handy official mark of 145 here, which gives him every chance if he’s been tuned up for this. 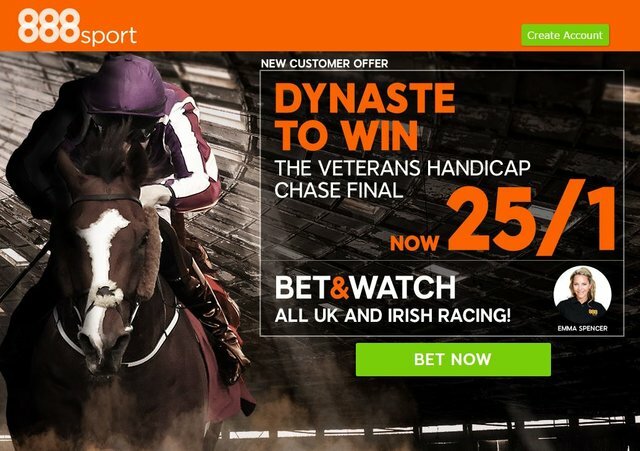 If you fancy Dynaste you could a lot worse than to register a new account at 888Sport and take advantage of this excellent welcome offer of 25/1 on Dynaste to win (Normal price just 7/1) . You are allowed a bet of up to £10 and all winnings are paid in free bets. Meaning a win would see a juicy £250 worth of 888Sport free bets added to your bonus bets balance. The yard is a shrewd one and the fact he is vying for favouritism says it all about his chances today. Aachen will appeal to many at bigger prices for Venetia Williams, whose stable is coming into good form lately. This thirteen year old veteran was second in this contest last year and has to be respected under the conditions. Forgotten Gold is another in double figure odds that can produce a good performance, Tom George’s charge has been in career best form of late and with champion jockey Richard Johnson booked to take the ride, the eleven year old gelding has fair place claims. But once again it is the Saturday master Paul Nicholls we look to with his ROCKY CREEK, a horse that has shown a willingness to show his best around the Esher track, a point he proved when winning over 3m5f here back in early December. He races from a mark which is 4lb higher this time around, but is a quality horse on his day and he stays forever. When Rocky Creek was operating at his peak, he was capable of mixing it at Grade 1 level and he’s always seemed to be better going right-handed. Everything is in place for a huge run on Saturday and with top apprentice Jack Sherwood claiming 3lb, Rocky Creek can prove King of the Veterans.